In 1988, I made a presentation at the ARRL National Convention which was held in Portland, Oregon. I discussed some of the pitfalls that the computer presented when used as a logging tool. I believe I said something like "Computer loggging will never be as efficient as paper logging." Nevertheless, I started developing TR LOG in 1989, when I decided two things within milliseconds of each other on a Sunday afternoon: (1) to operate the All Asian CW Contest that next weekend, and (2) to use computer logging software for the first time. I thought about using CT, but decided anything that made you type the call, then hit the INSERT key to start sending CW was just too crazy. So, I created a prototype and had it running around midnight on Thursday. I then won the contest and had the "CT" experience. I even called my 160 meter JA buddies by name. I had long cables to my headphones and would go into the kitchen or bathroom while the program was auto-CQing. I would run into the room and hit the J key ASAP when I got a response (to stop the next CQ from starting.) The program was perfect for this as the rate was often 30 per hour. I proceeded to add things and optimized the program for the California QSO Party - which I operated from K6NA - winning and setting a new record. I had relays set up so I could switch to CW on the other rig and start a CQ with a single keystroke. The program did its first CW using an external Z80 processor. The Z80's program was downloaded over a serial port, it was started up, and then commands could be processed from the serial link to send CW. The Z80 also supported some CW reading commands which interfaced to an AEA CP-1, and also some basic radio control commands for a Kenwood TS-430. This was the hardware setup for the Z80 op, which still claims to have made the first totally automated QSOs in a contest (during the 1986 ARRL Field Day.) The first implementation for TR LOG ran on the same hardware, and borrowed many of the basic routines from the original Z80 op code. Next came the ARRL November Sweepstakes, more changes and optimizations, and a top ten finish from W7NI. 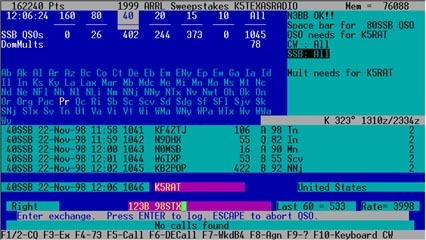 After that, I did the CQ 160 Meter Contest from WN4KKN's QTH in Texas, and together, we wondered how I was ever going to get back to the All Asian software, as the program had been changed so much - that going back was going to be tough. Shortly after the CQ 160 Meter Contest, I ended up in Europe for fourteen months with more free time than I could use up operating at 4U1ITU, so this is where a large part of the program was written. I still remember working on the exchange format descriptions for the manual while resting in bed after a lawnmower accident I had just before returning to the states - it was hard work figuring out all those details. I added computer generated CW to the program - using a 286 laptop for both development and testing. Ask N6ZZ about how long it took to download a new version of the program at 2400 baud from Europe. While the program is written in the "archaic" language of Pascal, it does have five or six Objects in it, using the extensions that Borland added in their Borland Pascal version 7.0. There are about 50,000 lines of Pascal code for TR LOG, and about 35,000 for POST (many of them are the same units however.) There are about 100 lines of assembly language code still used just for fun. I learned Pascal back in 1982, when working for Dennis K6OVJ (also known as NB6U, N6FU and now K5YA.) They had developed a test system for T1 lines between telephone central offices, and were using a software consulting company (started with four guys from my previous company.) The project I was hired to do was cancelled (after I convinced them it wouldn't work) and I needed something to do. So, I took over the project and did nothing but programming for a couple of years. It was one of my most productive periods with a similar pattern of adding new features. I would often stand at Dennis's office staring off into space and would say something like: "Do you think there would be any value in doing this...?" Then I would go do it. 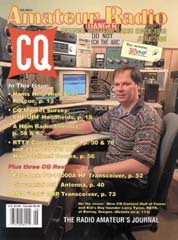 June, 2000 issue of CQ Magazine. I consider myself to be a simple programmer - trying to take the simple approach, instead of the confusing approach. I believe in the long run, this is the best way to develop software as typically you spend ninety percent of your time maintaining code. In this case, I probably spend even more. I have learned some tricks from K2MM who has helped me with some of the more tricky parts - like how to sort the TRMASTER data quickly. John is one of those brilliant programmers whose words I only hope to half understand most of the time. He is always challenging me to do the right thing instead of the simple thing. There are still a couple of procedures in the code that he has written, and I don't touch. He is even brilliant enough to write in Pascal if I make him.